pvc yellow garden hose -pvc hose manufacturer - Pvc Hose Manufacturer,supplier,OEM – Weifang Kaiyuan Plastic Co., Ltd.
Pvc Hose Manufacturer,supplier,OEM – Weifang Kaiyuan Plastic Co., Ltd.
Pvc yellow garden hose is used for conveying water,oil,gas under normal working condition in the factory,farm,ship,building and family. By adding colorful symbol lines on the surface of the hose, pvc hoses dubai looks more beautiful. Well and high quality control, Anti-erosion and adaptable to high pressure condition. It is light, flexible, durable, non-toxic without odor, transparent. Packing with PE film or as custom.Almost use PE film. Put into container by sea. As professional PVC Hose manufacturer,We can product any pvc hose as your require. 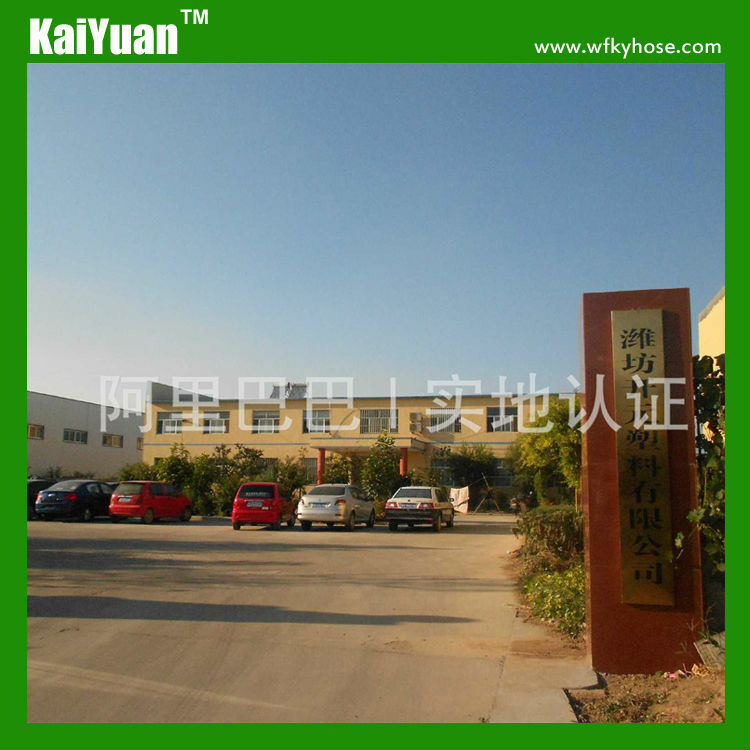 Our factory has 8years in pvc hoses.Weifang Kaiyuan Plastic Co., Ltd. is a professional PVC hose manufacturer with the right of import and export. we will uphold the business philosophy of"sincere cooperation,mutual benefit and win-win",sincerely develop cooperation with the international and domestic clients. 2,What is your delievery time? The time of delievery is 15-20 days. 3,What is the shipping port? We ship the goods via qingdao port. 4,What is your payment terms? 5,How should I contact you? 6,What is the location of your company? like to have a visit, you are much welcome. 7,What is your main products? Our main products are all kinds of pvc hose,including PVC Layflat Hose,PVC Steel Wire Hose,PVC Fiber Hose,PVC Garden Hose ,PVC Transparent Hose ,PVC Suction Hose and also we offer OEM services. We could send you the samples ,the samples are free to send to most places in China.If sent to other countries,transport fee shoule be paid by you.